A little over a week ago, a gamer narrowly missed being shot when The Elder Scrolls anthology saved the day. Longtime Elder Scrolls fan, RabbitMix posted their story on Imgur and then later Reddit. Both posts received massive attention and though an overwhelming experience it has lead to positive changes for RabbitMix thankfully. How did The Elder Scrolls Morrowind save the day? In RabbitMix’s Imgur post they explained the entire almost shooting accident. While I was at my desk playing Prey last night I heard a sudden loud pop and the sound of breaking glass. At first, I thought a light bulb had burst but soon noticed the cloud of drywall dust in the air and a bullet hole to the left of my monitor. RabbitMix went on to explain they searched the bedroom for the bullet and found it inside The Elder Scrolls Anthology. 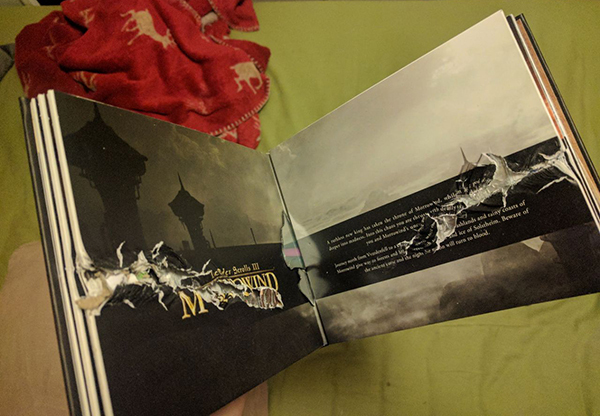 Sadly the bullet had torn through the Morrowind expansions but most fortunately that caused it to miss RabbitMix. There are no pictures of the bullet as most pictures were taken after the accident and police took the bullet. The Elder Scrolls Oblivion disc was saved due to being inside RabbitMix’s PC. But The Elder Scrolls Construction Set, TES 3 Tribunal, and Bloodmoon were all damaged. In addition of course to The Elder Scrolls 3 Morrowind which took the brunt of the damage. RabbitMix went into more detail about the scary event in an interview with PCGamer. Further, as suggested by the Imgur and Reddit communities, Bethesda helped RabbitMix out with replacements. 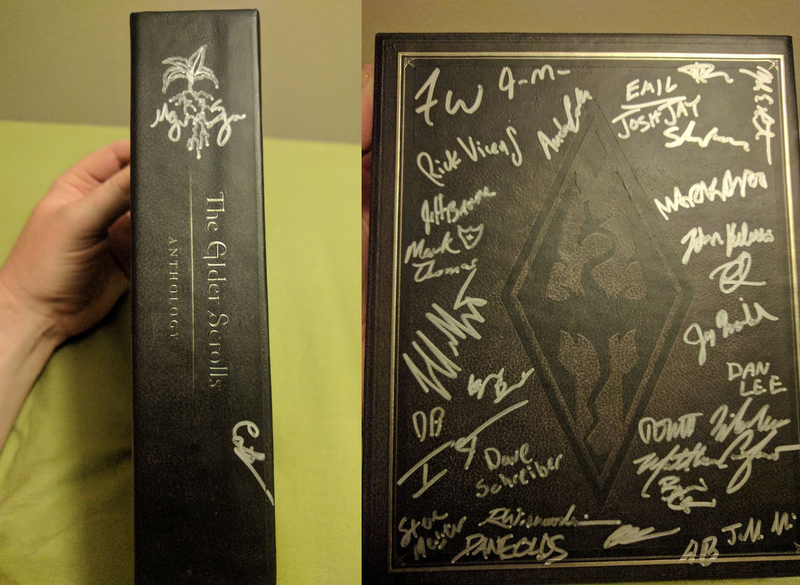 The Elder Scrolls Anthology may have saved a life but it must still be enjoyed! 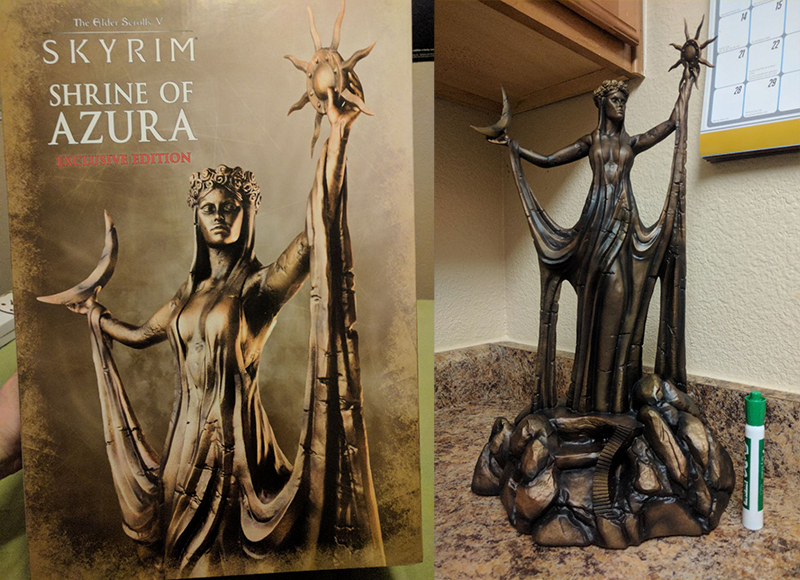 What did Bethesda gift in replacement of The Elder Scrolls Anthology? Good guy Bethesda and VP of PR and Marketing Pete Hines were hot on the case, ready to help out. 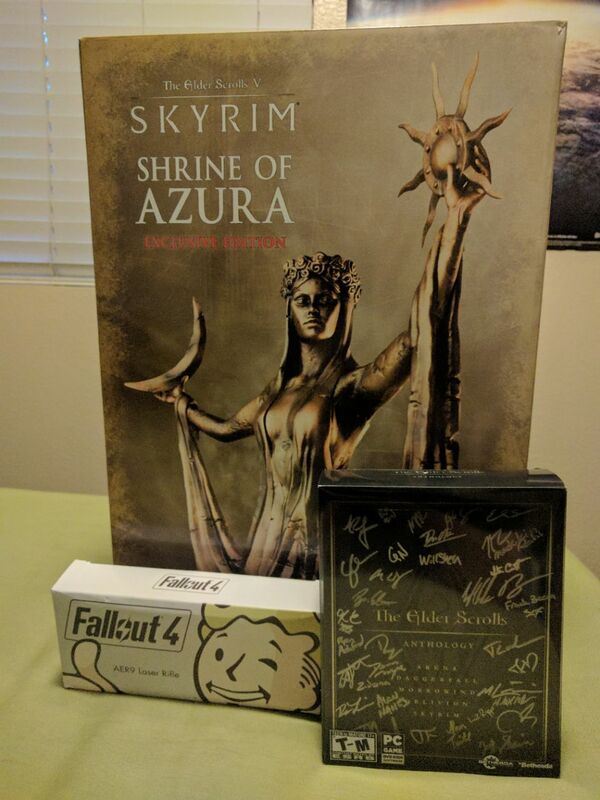 As soon as the Elder Scrolls story appeared online Bethesda organized a replacement gift with some amazing extras! As if having your life saved by The Elder Scrolls wasn’t enough of a gift, check out the goodies RabbitMix ended up with. 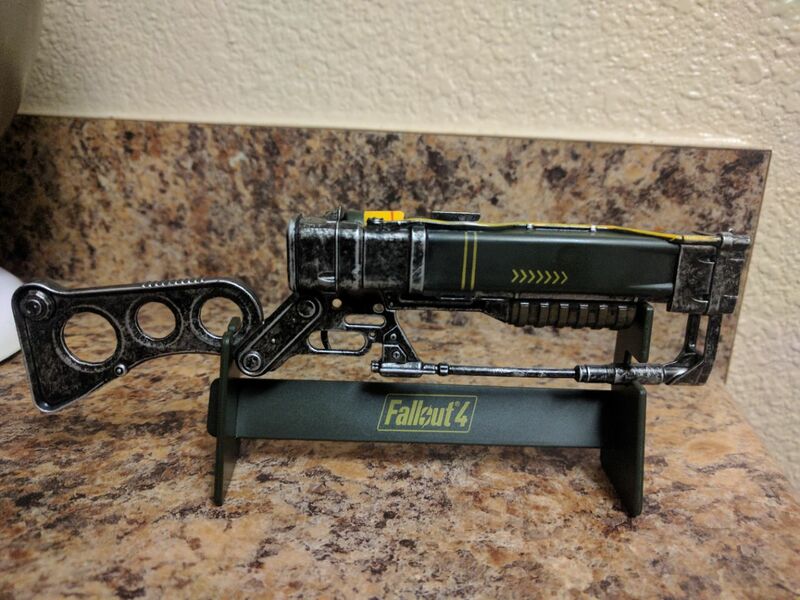 Pictures of all the legit gifts Bethesda sent are in the gallery below. Most people deserve for something good to happen to them, especially coming out of a crappy situation. It’s great to see positive changes happening for RabbitMix after the stress of this accident caused by a careless neighbor. Since the accident, on top of the gifts sent by Bethesda RabbitMix has been offered a nicer unit at a better cost by their landlord. Moreover, a super generous Imgur user @NewManagement noticed RabbitMix’s desk and bought their fellow Imgurian a new desk. What a legend. In closing, RabbitMix had a lovely message for Bethesda and surely, even more, appreciation for their favorite game series. Hopefully, this lucky gamer also got some sneaky news on The Elder Scrolls 6. The Elder Scrolls Online Morrowind Early Access starts May 22 and pre-order is available now. I’d like to end this by sending out a HUGE thank you to everyone at Bethesda who made this happen. You’ve taken one of the scariest nights of my life and turned it into something good. I never thought something this exciting would ever happen to me, you guys are seriously the best and if I wasn’t already a fan for life this definitely solidifies that!